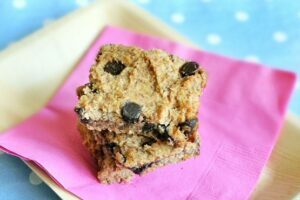 Healthy Chocolate Chip Chickpea Blondies - NO Flour! So a blonde walks into a bar. Or in this case, the blonde is the bar! I’d tell you these Chocolate Chip Chickpea Blondies are healthy. But then, if you try them, you will think I am a liar and never believe another word I say. 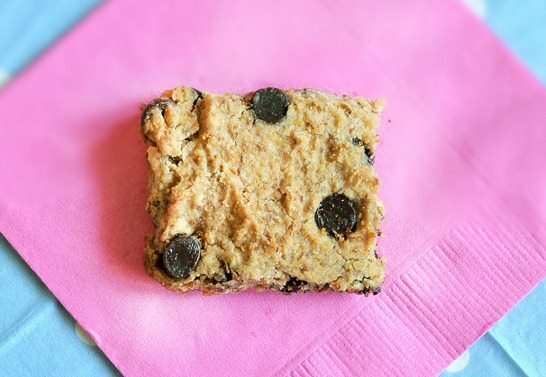 If you taste the chickpea blondies, you won’t believe they’re healthy! 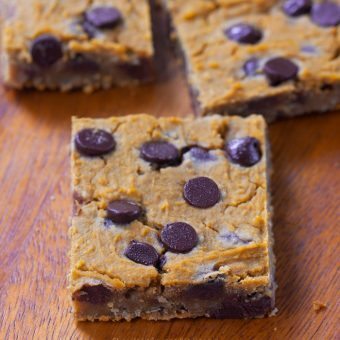 Low in calories, rich in omega-3s, and gluten-free… These healthy blondies might just be the smartest blondies in the world. 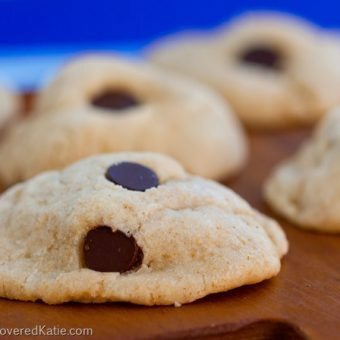 A new addition to the archives of Healthy Cookies – Over 100 Healthy Cookies Recipes. But I really enjoy putting a different, creative spin on old trends. Hmmm… now how to put a new spin on black bean brownies? The answer was so simple, even a blonde could have thought of it: White Bean Blondies! And they have no eggs and no flour! The resulting chickpea blondies are so moist and fudgey. Preheat oven to 350 degrees. Blend all ingredients (except chips) until very smooth in a good food processor (not a blender). Mix in chips, and scoop into a greased (or parchment-lined) 8×8 pan. Optional: for “prettiness” you can stick some chocolate chips on top of the batter as well. Bake for around 30 minutes. They’ll look a little undercooked when you take them out, but they firm up as they cool, and you don’t want them to get hard. I have a sneaky suspicion that many so-called “dumb blondes” are not really as dumb as they seem. They just act dumb for attention and because they think guys think it’s cute. Sadly, it seems, they’re often right. Many guys are intimidated by smart girls and therefore find ditziness attractive. Did you know any of these girls in high school? I remember the notorious dumb blonde in my high school once remarking, Wait, wood comes from trees? I thought they made wood in factories!” Yet this girl was in accelerated math and English classes, as well as in the top 10% of the class. Something didn’t equate… or did it? After such statements as these, the boys always laughed. This girl was not dumb; she knew airhead remarks such as the above would win her popularity and romance. On the other hand, girls who are studious, eloquent, and assertive are often labeled as nerds (or worse). « Want to be featured? A) These are amazing. 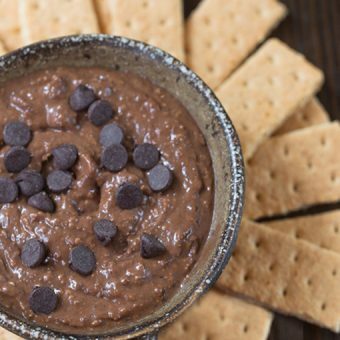 You could just add cocoa powder and have a healthy PB brownie too! B) I definitely agree the these famously dumb blondes are smart. They have to be to have made a fortune by being dumb! 🙂 Those girls in HS drove me nuts. My reunion is next month and I cannot wait to see what they’re doing now. Watch them be aerospace engineers or something. LOL! Haha either that or divorced with ten kids from three different husbands and wrinkled from tanning beds (not that I’m judging. I went through the bad tanning bed phase in hs too embarrassingly enough). You are a genius! 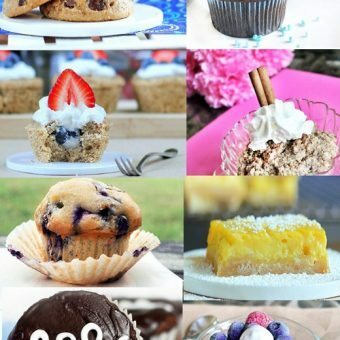 I might make these today! Quick question – do just throw in the can of drained/rinsed chickpeas or should I blend them up in the food processor first? Thanks for the great recipe – on my “to bake” list this weekend. I don’t bother blending them first. Just throw all the ingredients in at the same time and then blend :). But perhaps if you blend the chickpeas separately first, it’ll speed up the time it takes to get the mixture smooth? So really, you can do it either way! Do you mean blend with a blender or hand mixer? That’s rude! How disgusting- get off Katie’s blog, you bully! You have some nerve! Mmmmmmmm!!! I’ve used chickpea flour in brownies but never chickpeas! I bet these are so much more moist. And uh, blondies have more fun! If I make them I’m calling them Lady GaGarbanzo Bean Blondies. Oh my word LOL! I love your name!! I’ve fallen into the ditzy trap… 🙁 I was always pretty smart but I was so insecure about it because it really set me apart from all my friends. I remember when we were just learning about exponents in school the question was what is 5 to the power of 2. Everyone wrote 10, except me who wrote 25 but I ended up being so shy about being the only one with the right answer that I erased it and wrote 10……. Now that I’m more mature I’ve learned to embrace my brain 🙂 And smart girls can be cute too!! I wish I knew that in 6th grade though! Did you ever try using Palm Sugar (coconut sugar) as a sugar substitute? I keep reading about the health benefits. I used palm sugar today (and coconut butter instead of PB) and they turned out ready crumbly. Do they stay together better with brown sugar and PB… or stevia and PB? 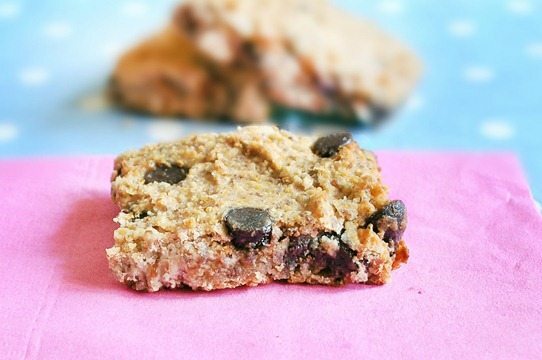 I’ve made these multiple times with coconut sugar and peanut butter and they were delicious and not at all crumbly! It’s probably the coconut butter. When you bake with coconut flour, you have to increase the liquid as the coconut flour absorbs A LOT. If you want to keep using the coconut based products, I’d up your liquid by maybe half again as much. 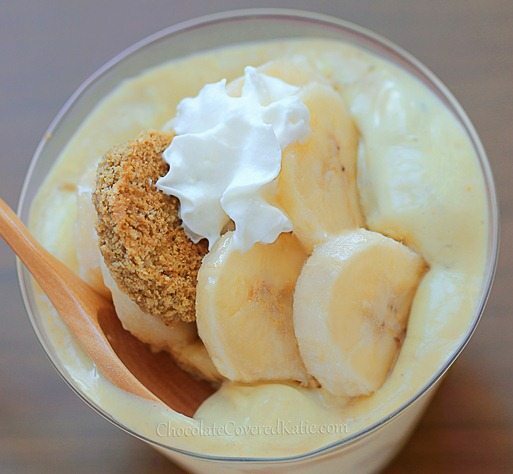 AHH this is possibly one of my FAV recipes ever on CCK!! YES i do know those dumb blondes… I can only think of one.. and Im actually really good friends with her and shes REALLY smart and An amazing person! idk why she acts dumb sometimes- it used to be worse! I hate that stereotype! And I get so mad when girls perpetuate it by acting so dumb. I AM a blonde, and I’ve struggled to prove that we can be smart and to be taken seriously my WHOLE life! Oh, and I agree with everyone else. These blondies are gorgeous and I am going to have to make them! And your photography gets better by the MINUTE! Oooooh these look delicious… and they’re gluten free? Well, I’ll be making these then! Hmm… I’d debate if these “blonde moments” are put on. I have a PhD in Chemistry and I still sometimes find the simplest of tasks such as constructing coherent sentences, crossing roads and simple mental arithmetic a little tricky. Brilliant recipe though – can’t wait to get out of the lab to try it! These are delicious! I added a whole teaspoon of cinnamon to mine. I also found that the texture and flavor only get better after sitting out for a day (and up to three so far), especially if they seem underbaked at first. I tried modifying to make brownies, and accidentally overbaked them; definitely err on the side of underdone as Katie suggested. I am in the same boat as you. I’m about to start a PhD in Biology but everyone always makes fun of how I talk. I’m always smashing sentences together or flipping nouns around or (worse yet) talking like I’m from Missour-ah. I agree; we all have our dumb moments. I have a graduate degree, earned straight As, but when I’m just not thinking along certain lines, the obvious is NOT so obvious! And by the way, I was about 30 years old before I understood that you had to peel an onion. I never cooked with them until then (very picky eater until later in life; now I eat everything and can cook much better) so how would I know! However, most of the time I am quite brilliant in my creative problem-solving skills. Einstein was a social idiot, ya know…We all have our moments. Let’s embrace them and use them for a good laugh! LOL! I love this comment! I totally agree, I’m a civil engineer, graduated 7th in my class, and some things just fly right over my head :-/ Not dumb, but I’ve definitely fallen victim to “dumb blonde” comments and remarks. (Which by the way blonde haters, are hurtful!) I’m willing to bet that females of every hair color can be just as air-headed. Women should support women, no matter what hair color, body type, ethnicity, or whatever you are! I admit to sometimes having “dumb blonde” moments. And when I was younger I definitely did use my blondness to get attention. But I’m trying to learn that the types of guys who pay attention to my “dumbness” aren’t even the types of guys I WANT to attract! These looks amazing! Have you ever thought about writing a cookbook? You are too sweet, Emma. Of course you will be getting a free copy. You’re my #1 taste-tester!!! I agree with Emma. So far made 2 recipes and loved them both. You’re amazing Katie! I hate when girls dumb themselves down for guys. In the long run, it really does you no good. I totally agree that people like Jessica Simpson only put on an act with their so-called “dumbness”. Pretty brilliant ploy seeing how much she made off of it. Those blondies look absolutely fantastic!!! Could they be made without the flax?? I have everything on hand except for that. Maybe you could use flour in place of the flax? I’m not sure… but hey, if it doesn’t firm up you’ll still be left with a yummy gooey mess to devour! Let me know how it goes, if you do try it! I’m. Making. These. They look and sound awesome, so I bet they are. Thanks AGAIN for another new recipe! Oh my gosh, I cannot wait to try these! Making these today! I HEART all your recipes, CCK!